In 2003 or 2004, recently retired Army Chief of Staff General Eric Shinseki held a breakfast for Harvard students who participated in MIT’s ROTC program and military veterans at the Kennedy School of Government. At the time, the situation in Iraq was at one of its lowest points, and the General’s famous warning that invading Iraq would require something “on the order of several hundred thousand soldiers” was starting to seem very prescient. However, it was not his commentary on the Iraq War that was most memorable. In fact, he refused to comment on it, because he did not want to send the troops a confused message while they were actively fighting a war. 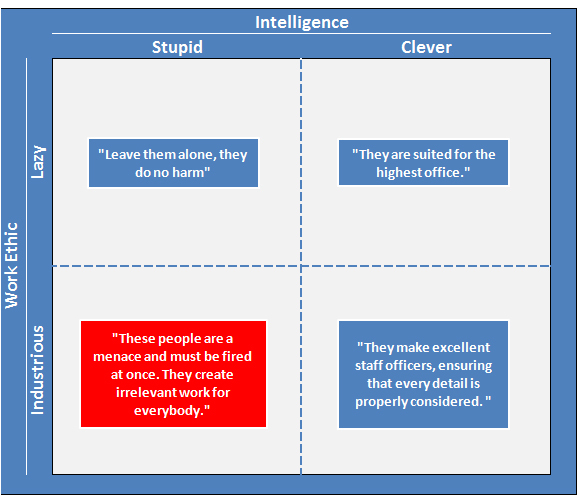 What I remember most from the breakfast was the General’s humorous description of German Field Marshal Erich von Manstein’s leadership matrix pictured below. As the matrix above shows, von Manstein saw industrious and stupid leaders as tbe bane of every organization. According to Henrik Bering, they not only “create irrelevant work for others but” also are “likely to squander the lives of others to further” their own ambitions. While I certainly agree with von Manstein’s belief that industrious and stupid leaders can wreak havoc on organizations, I am less inclined to believe that lazy and clever people are the best senior managers. In the 1930s and 40s, von Manstein’s categorization may have been appropriate, but today, in an age of information overload, it is the industrious and clever who are required to navigate through tough times. In fact, one of the reasons why I believe there is a massive failure of leadership throughout many organizations today, from the Oval Office to many financial institutions, is that most leaders are of the lazy and clever variety. For instance, it is no coincidence that many financial chiefs did not understand the complexities of their derivatives businesses. This superficial understanding of these complex financial instruments likely contributed to the 2008 financial crisis. Contrast this with many of America’s military leaders. For instance, few would argue that the serially successful General Petraeus is a leader of the lazy and clever variety. Admittedly, von Manstein’s matrix is too simplistic to account for other important aspects of leadership like audacity, decisiveness, and creativity. That said, I still believe the world’s increased complexity has left lazy and clever leaders behind. Those who have remained have left nothing but failure in their wake. This entry was posted in Defense, Leadership, Policy, Politics, War and tagged Field Marshal Erich von Manstein, General Eric Shinseki, General Petraeus, Harvard University, Kennedy School of Government, Kursk, Leadership, von Manstein's Matrix. Bookmark the permalink. “Lazy and Clever”. If that doesn’t sum up pretty much any politician, I don’t know what does. Very interesting perspective – I can see numerous applications of it in the corporate world, from entrepreneurs on up to F500 giants. You espoused your “belief” against the lazy and clever. Yet Gen. Von Manstein was simply using another way of espousing the 80/20 Principle, in my opinion. A friend told me “Freud said about belief systems that it is not whether the belief is true or not but how it makes you feel about yourself.” . In the end maybe it all comes down to Freud’s definition of Belief Systems…….its not whether its true or not, but how it makes us feel….and a majority in power feels good about continued spending, and thinking about its consequences does not. Therefore, empires rise and empires fall..Same with companies. As a sidebar, the massive failure of institutions is impacted by their lack of ethics and integrity, not because of laziness and cleverness, in my opinion.